Virginia Tech junior libero Carol Rafferty pulled up a match-high 13 digs as the team faced off with IUPUI to open the Bobcat Invitational in Athens, Ohio, Friday afternoon. In the third set, Rafferty notched her ninth dig to become the 17th player in school history to join the 1,000-dig club. Raffety scoops up her 1,000th career dig! 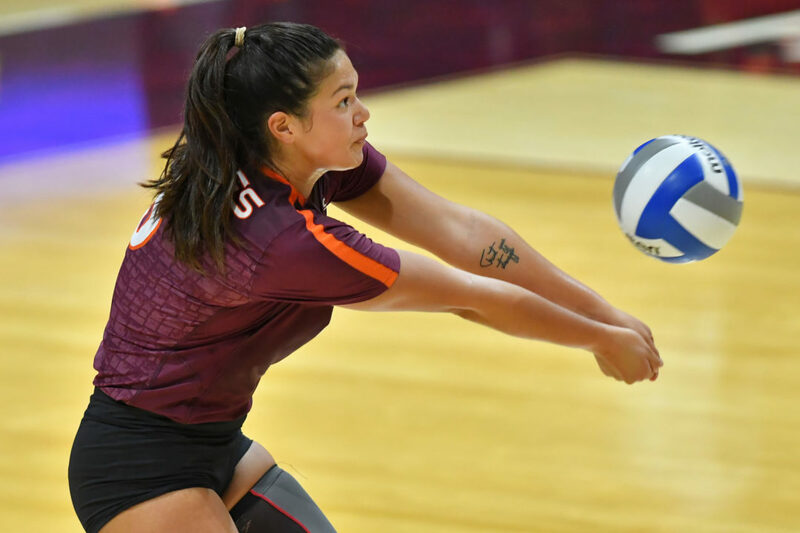 The Novato, California, native already has had a standout career with the Hokies, setting a freshman digs record in 2016 with 481, the most since 2004 (Amanda Cloyd) and 10th most on the school’s season records list. All told, Rafferty has notched double-digit dig totals in 60 matches, including 20 or more in 11 contests. In addition, she has dished out 179 assists and served up 56 aces. In 2018, she has pulled up 83 digs to go with 26 assists and four aces. Her 1,004 digs rank 17th all-time in school Lore, but she is just 164 away from Amanda McKinzie‘s 10th place mark (1,168 from 2013-16). If she keeps pace as 400-plus digs per season, she could easily reach the second place mark of 1,710 (Heather Berglund, 1990-93). It is likely a stretch for her to catch Cloyd’s record of 2,200 (2004-07). Thus far in 2018, the Hokies are 7-0 heading into Friday night’s meeting with Ohio at 7:30 ET. Virginia Tech wraps up the weekend in Athens, Ohio, with an 11 a.m. ET Saturday match against Samford.